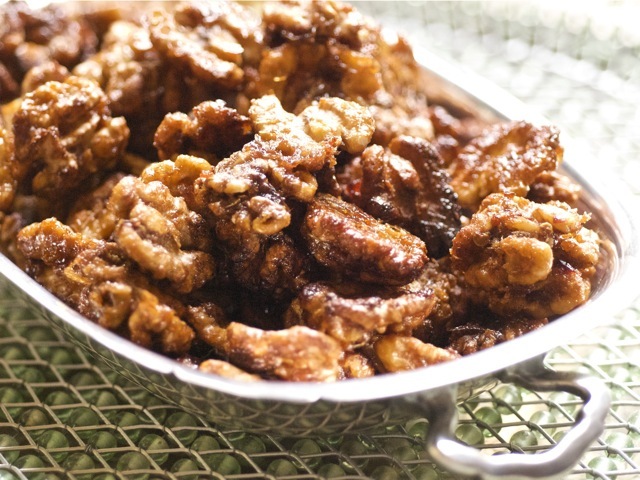 These candied walnuts have a hint of spicy Thai flavors and make a great party or anytime snack. Use them as a topping for salads or an addition to stir-fried vegetables. In a bowl, mix together the sugar, chile sauce, vinegar, lime juice, and ginger. Put the walnut halves in the bowl and turn them well to coat them. Let stand 30 to 40 minutes, turning from time to time. Remove nuts with a slotted spoon and place them on a baking sheet lined with aluminum foil. Bake until lightly browned, approximately 8 minutes on one side. Stir once or twice and bake another 5 minutes. Watch the nuts carefully to avoid burning. Remove from oven and immediately transfer to a plate. Let stand at room temperature until cooled. They will become crunchy. Store in an airtight container for up to 1 week, or freeze for up to 1 month. If frozen, let stand 15 to 20 minutes before serving.